The latest book review from Ian Shone has now been posted in our reviews section. 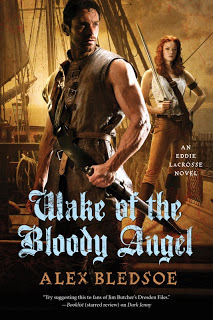 If you like a fair bit of hokum and pirates then Wake of the Bloody Angel by Alex Bledsoe might well be your cup of tea! If you guiltily enjoy the likes of Ian Fleming or Robert E. Howard, then there is a good chance you’ll enjoy Wake of the Bloody Angel, and it’s the ideal book to give yourself a break if you have just finished reading something dry and heavy. Enjoyable nonsense, and nicely done.